Dover Publications are treasure bargains for children of all ages, parents of all children, artists and aspiring artists, historians, naturalists, puzzle freaks, and the genuinely curious. 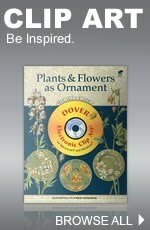 Founded in 1941 by Hayward and Blanche Cirker, Dover has published works primarily in the public domain across an astonishing range of topics. Having had Dover books all my life, I was delighted to recommend them to a friend who was seeking “classy” coloring books. I knew that she meant Dover’s Coloring Books. I wanted to include the entire Dover subject list, but shall provide this link and just a hint of the length and breadth of the catalog: African-American History Month; American History (Americana); American Indians; Antiques (Collecting); Art (Anatomy for Artists, Art Instruction, Clip Art, Commercial Art & more); Art Activity Packs; Brain Games (Chess, Classic Board & Card Games, & more); Civil War Books; Clip Art (Angels, Animals, Celtic Art, Design Tools [with CDs for Photshop!] and more); Coloring Books, and much, much more. While it started with both feet in the print world, Dover has come roaring into the 21st century with design and other books with CDs, a website which will draw you in and take your time in the nicest and most productive possible ways, and the opportunity to subscribe to newsletters for free samples, catalogs and ecards.